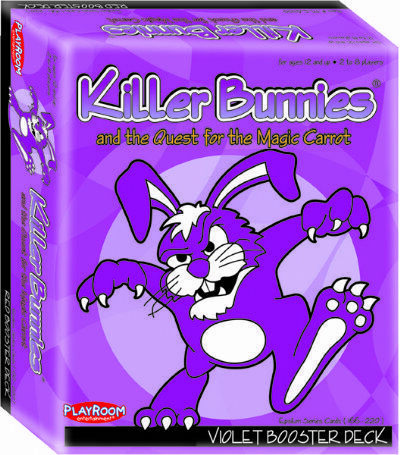 A brand new type of bunny is introduced in the KB Quest Violet Booster Deck Specialty Bunnies, which make taking double turns a snap! Spoofed from various pop-culture sources, not only will the new bunnies give you a chuckle, but they will also speed the game up and allow players to do more on each turn! The strategy deepens with Insight (to give players a chance to view the top 5 small Carrot Cards), Bunnies In Black (to prevent your bunnies from getting abducted by the Beyea Aliens), Low Jack Kojak (to annoy opponents by making them return Carrots to Kaballa*s Market), and four more Carrots - now there are 20 to collect!